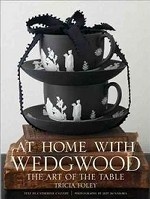 Аннотация к книге "At Home with Wedgwood: The Art of the Table"
There`s only one Wedgwood, but there are limitless expressions of Wedgwood style. At Home with Wedgwood showcases 250 years of the company`s innovations-in all its manifestations-and the imaginative ways today`s collectors draw inspiration from the past and integrate Wedgwood pieces into their lives. Whether gracing a table for Saturday breakfast, bringing whimsy to a garden party, or arranged for a formal affair, Wedgwood is classically beautiful yet contemporarily stylish. Quite simply, Wedgwood is as much at home on the everyday table as it is when carefully styled for special occasions. At the heart of At Home with Wedgwood are the homes of a group of renowned collectors, beautifully photographed to reveal how this diverse and dynamic group of people live and entertain with Wedgwood. From Carolyne Roehm`s movable feast to Charlotte Moss`s after-the-ballet supper, from the vintage collection that fills Thomas O`Brien`s country house to Jasper Conran`s English style, and from Vera Wang`s elegant bridal shower to Martha Stewart`s perfect setting, you will see how today`s style makers draw on their Wedgwood for every occasion. At Home with Wedgwood also includes a stunning visual gallery of patterns-from classic favorites to popular new motifs-and a portrait of Josiah Wedgwood, the company`s inspirational founder whose values still inform Wedgwood today. Finally, a resource section makes this both a sumptuous book of style and a practical guide to the world`s best-known maker of tableware.